← Do Women Write Better Than Men? When I was young, most of our fruit and nearly all our vegetables came from the garden or nearby farms, freshly picked in summer and from jars that filled the two large cupboards in our basement during the rest of the year. In the late summer and early fall, our house was filled with the hot steam of the constantly boiling canner and the tinny ping of sealing jars. My grandma and grandpa visited for weeks at a time and would sit on the porch, stringing beans or peeling apples for applesauce or jam. Lest you think we lived in some kind of rural haven populated by farmers, I should point out that I grew up in what could only be described as a bedroom community suburb of Cleveland. Both my parents worked, which makes the amount of food they put away each year nothing short of amazing. Colorful jams and jellies of every description, applesauce, pears, peaches, plums, grape juice, tomatoes, a variety of pickles, green beans, corn, and probably a dozen things I can’t remember — jars and jars of them all. In our house, the concepts of “local eating” and “organic” were unknown. Gardening, buying from local farms, and preserving food had less to do with what into and on our fruits and veg and more to do with the economics of putting food on the table (though I have to say my father — and indeed his parents — were big fans of manure). I never considered myself a gardener, but as soon as The Engineer and I bought a house, I started planting, almost instinctively. Drawn by the prospect of a tomato, right off the vine and still warm from the sun, or raspberries that never quite make it to the table, I couldn’t help myself. Now that we live in the woods, my gardening is limited to a series of pots lining the driveway (an obstacle course for any unwary driver who happens to visit), and we’ve joined a CSA. This local farm provides our family with lots of lovely produce throughout the growing season, and eggs and chicken all year. For a long time, I felt guilty for not preserving food — especially after my parents eventually split up, and I ended up with the family pressure canner. It sat in our loft, the one-eyed stare of its steam gauge accusing me of being a slacker each time I walked past. After that, the familiar rattle of the pressure regulator sounded less like a jaunty rhythm and more like a bomb about to blow. I never did use that pressure canner and eventually sold it a garage sale to a large family. They were delighted to get it. I was delighted to see it go to someone who would use it. Time passed. Grandma and Grandpa are both long gone, as is my father. And I have finally begun to can. 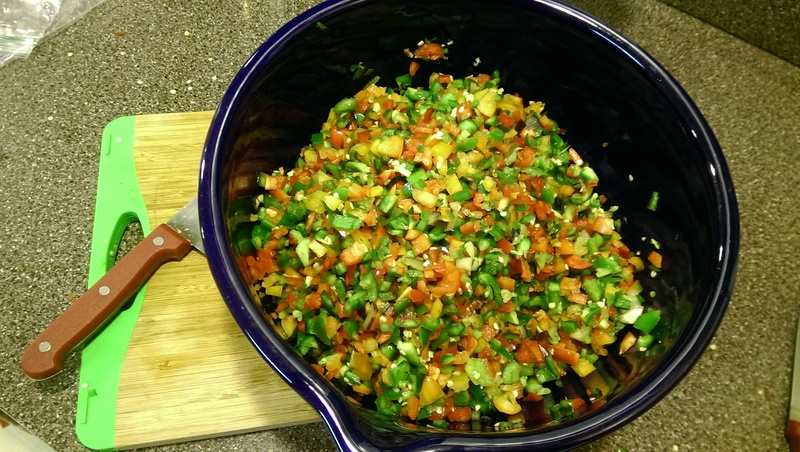 It began innocuously, with a bumper crop of peppers from the CSA. I’d already chopped and frozen several bags for use in the winter, but honestly, how many peppers can one family eat? Certainly not this many! Then, one day, at the local farm market, I happened across a little booklet about making jams and jellies, including hot pepper jelly. The solution became obvious. I already had a some jars leftover from Christmas gifts, and I love hot pepper jelly over cream cheese — why not make my own? 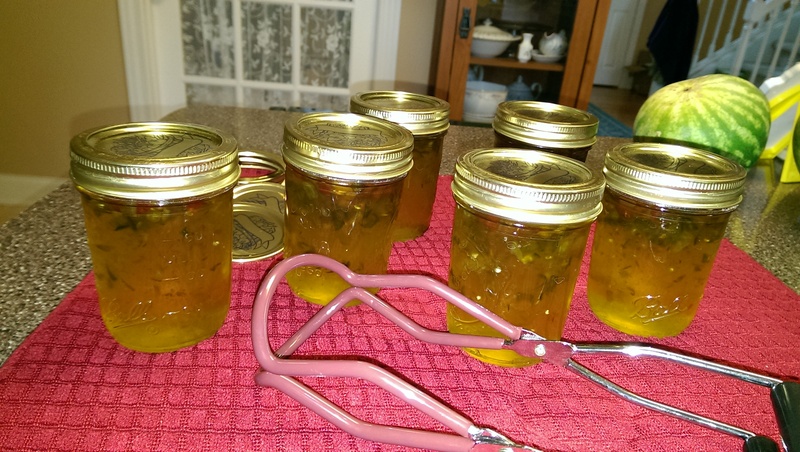 I found a great recipe complete with pictures at Mel’s Kitchen Cafe (http://www.melskitchencafe.com/jalapeno-jelly-and-a-canning-tutorial/). My friend Barbara gave me a pair of canning tongs she’d won. In three weeks, I’ve made and canned Apple-Pear Sauce using Robin Davis’s excellent recipe (http://foodcookeat.com/2014/09/02/apple-invasion/), two more batches of pepper jelly (with enough peppers chopped for batches three and four), ginger pear jam, and two batches of cinnamon cider jelly (lots of recipes online). Dad would be proud. My mom certainly is. I think Grandma would laugh at me, canning tiny 1/4 pints of jelly to give as gifts. I’m not sure she’d consider it canning at all. Still, I think the ginger pear jam would make excellent bar cookies with a crumble crust and sprinkle. Don’t you? 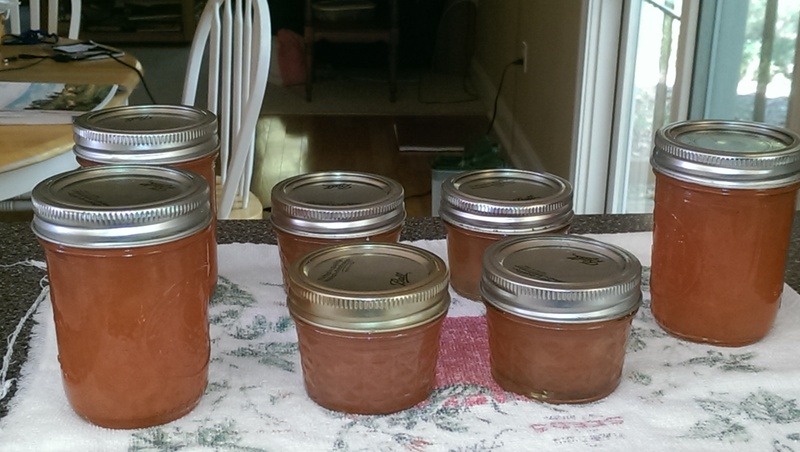 This entry was posted in Uncategorized and tagged apple pear sauce, Canning, cinnamon cider jelly, Community supported agriculture, CSA, Eating local, family traditions, Food preservation, ginger pear jam, Jalapeno Jelly, local foods, locavore. Bookmark the permalink. Sounds delicious. Guess that’s next. After the homemade bread, of course! Found quite a few pear ginger ham recipes online. Can’t remember which I used because I printed so many. They’re all very similar. Pressure canning scares me, though I might branch out into tomato sauce next year. Seems acidic enough to not be an issue. Here’s the link for the ginger pear jam I made: http://www.food.com/recipe/ginger-pear-jam-390296. And here’s the cinnamon cider jelly I made, which was really a hit: http://mail.mamashealth.com/recipe/preserve/ginger.asp. It also uses liquid pectin. I’ve been fortunate enough to be able to find both liquid and powder so have just used whatever the recipe calls for, but I would imagine it could be substituted package for package. There were lots of other pepper jelly recipes on the interenet. I just chose that one because of the pictures showing every step — seemed like it would be harder to screw up. But I bet you could find a recipe using powdered pectin. Fingers crossed for your scan, and prayers said too. Sending you good karma. Thank you, both for the recipes, and for the prayers and good karma. There’s so much positive power coming my way that the bone scan can’t possibly show anything nasty….